Carrera Quinta, Colombia Andean Jazz , was created in 2006 by Javier Pérez Sandoval and Francy Montalvo. Carrera Quinta blends contemporary jazz with traditional Colombian music creating an unique, intense and powerful sound. The new album “Big Band”, financed with a crowdfunding campaign, gives a new perspective for Big Band and Latin Jazz music. En esencia, published in 2009, is the band´s debut album. In this Javier and Francy bring a new sound to the traditional Colombian music. Geners like Pasillo, Bambuco and Guabina are blend among Jazz elements. Carrera Quinta has participated in competitions around Colombia, such as the 2010 Hatoviejo-Cotrafa Music Festival, one of the most important performance competitions in Colombian traditional music, as well as the 2010 competition Festival de Nuevas Músicas Mestizas (new crossbreed musics) organized by Bogotá’s Chamber of Commerce. In 2009, Francy Montalvo’s composition “En Esencia” was a winner in the Colombian Cultural Department traditional composition competition. In 2006, they received a research scholarship from the Colombian Cultural Department. The research centered on the application of jazz improvisation in Colombian traditional music. 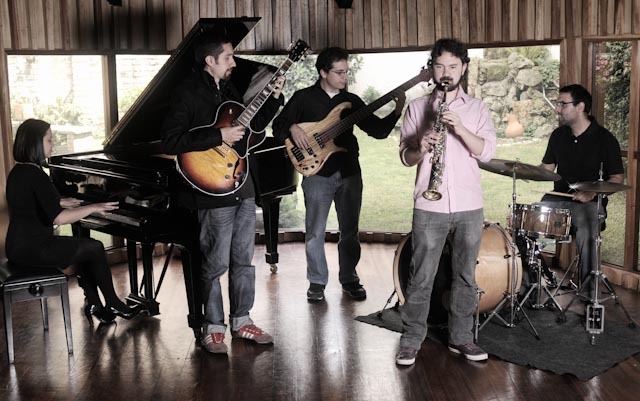 Carrera Quinta features Pedro Acosta (drums), Cesar Medina (saxophone), Dario Montoya (flute), Daniel Montoya (electric bass), Javier Pérez (guitar), and Francy Montalvo (piano), all of them faculty members at Universidad el Bosque School of Music in Bogotá, Colombia. Carrera Quinta has published two books: Method of Improvisation in the Colombian Pasillo (2006), and Pasillos, Bambucos, Guabinas, An Urban Vision (2009). In December 2006, the magazine Arcadia reviewed their first book and called it one of the most important music books published during that year. They also have published articles about jazz influences in traditional styles in the Colombian Cultural Department’s journal A Contratiempo. Their research has been presented in musical conferences in Colombia and in the VII Congress of the International Association for the Study of Popular Music – Latin American Branch held at Universidad Católica in Lima, Peru in 2008. Carrera Quinta has crossed successfully into Big Band arrangements of their brilliant compositions. Their performance artistry is without question and their composing is stellar. The album Big Band is a full-blown expression of the sensitivity, delicacy and emotion that can be achieved by an arranger who knows what they are doing. Carrera Quinta encompasses a unique new perspective that interweaves the best of two worlds: contemporary American jazz and traditional harmonies and rhythms from South America, in this case the Andean region of Colombia.